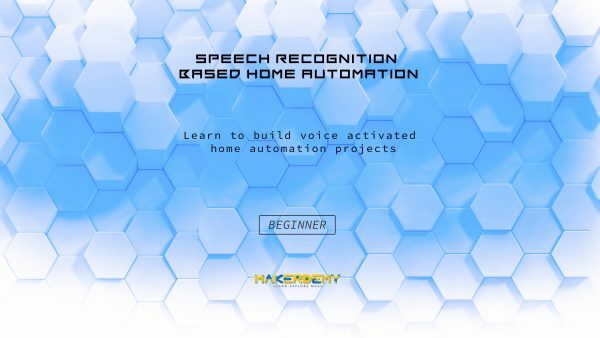 This course will focus on teaching you how to set up your very own speech recognition-based home automation system to control basic home functions and appliances automatically and remotely using speech commands. Furthermore, we will teach you how to control a servo motor using speech control to move the motor through a required angle. To learn how to automate your home, the best place to start is with your personal needs. So, in this course, we will focus on basic control of lighting and ventilation inside a home. This will give you a solid base to build upon by teaching you the basics required for simple speech-controlled automation and enable you to automate almost any appliance in your house – limited only by your creativity and knowledge. Once we have grasped basic lighting control, we will move on to controlling a servo motor using PWM output from the Raspberry Pi GPIO pin. We will also use python file I/O to store the motor’s position. This home automation course will involve teaching you how to control and automate lighting and ventilation appliances, with the potential for expansion of the system to control a variety of services and functions – from home appliances to monitoring and security systems. The system used for home automation will involve using Raspberry Pi 3 and writing python codes as modules for Jasper, which is an open-source platform for developing always-on speech controlled applications. This course aims to help you attain control of household activities, and appliances via futuristic speech recognition. Using Speech-to-text and text-to-speech engines, it is possible to communicate effectively and efficiently with Jasper to carry out simple commands or tasks like activating, and deactivating relay switches to control home appliances without the need for physical exertion. This course will also teach you how to modify the open source Jasper platform to use Snowboy hotword detection engine for offline speech recognition for keyword detection while using wit ai online speech recognition for command word detection. We do this as a precaution to safeguard the privacy of the user while retaining Jasper’s always listening feature.